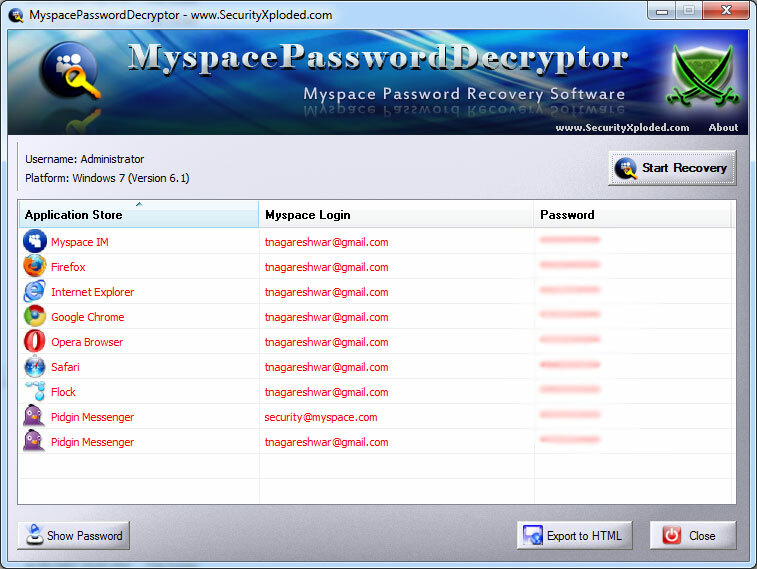 Myspace Password Decryptor is the FREE software to instantly recover Myspace Account passwords stored by MySpace IM, web browsers and instant messengers. Most of these applications store the login passwords so that user don't have to remember and enter the password every time. Each of these apps use their own local storage format and proprietary encryption mechanism to store the login passwords. Myspace Password Decryptor automatically crawls through each of these applications and instantly recovers all the stored Myspace Account passwords. It presents both GUI interface as well as command line version, the later is more helpful for Penetration testers in their work. Apart from normal users who can use it to recover their lost password, it can come in handy for Forensic officials who can get hold of any stored Myspace passwords. Instantly decrypt and recover stored encrypted Myspace account passwords from popular web browsers, Myspace IM & other messengers. It comes with Installer for local Installation & Uninstallation of Software. MyspacePasswordDecryptor comes with Installer so that you can install it locally on your system for regular usage. It has intuitive setup wizard which guides you through series of steps in completion of installation. Next click on 'Start Recovery' button and all stored Myspace account passwords from various applications will be recovered & displayed as shown in screenshot 1 below. By default passwords are not shown for security reasons as it is sensitive data. However you can click on'Show Password' button at the bottom to view these passwords. 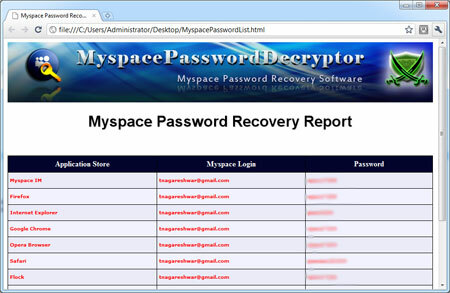 Screenshot 1:Myspace Password Decryptor is showing the recovered Myspace account passwords for popular applications. Screenshot 2: Command line usage of MyspacePasswordDecryptor showing various examples. Screenshot 3: Exported list of of recovered Myspace account passwords by MyspacePasswordDecryptor in HTML format. Mega release with support for recovering Myspace passwords on new Windows 10 version. Also support for new Firefox login file 'logins.json' starting with version 32.x. Enhanced Installer for dynamic downloading of latest version. Support for Windows 8. Fixed the problem with Safari Plutil file location, Improved Password html report. Support for report generation in XML format in both GUI & Command-line mode. Improved interface with cool new banner. Added links for PasswordForensics.com in about section and few minor bug fixes. Myspace Password Decryptor is not a hacking tool as it can recover only your stored passwords. It cannot recover the passwords for other users unless you have right credentials.